Profiterole is a type of dessert made with éclair filled with custard, chantilly cream, whipped cream or ice cream, and then covered with chocolate cream or caramel. The most common presentation of this dessert is done by placing individual profiteroles in an "hummock" called croquembouche. Profiteroles originate from the Renaissance when Caterina de Medici, got married to Henry II of France, and later became queen, She brought from her homeland (Tuscany) all of her own gastronomy recipes; one of Her chef, a guy named Popelini, created in 1540 the choux pastry (the éclairs), which became very popular in France (like many other Italian recipes), and with it profiteroles as well; However, the success of this dessert spread after the seventeenth century, time during which the true pastry making trade developed. The word profiteroles (also spelled prophitrole, profitrolle, profiterolle) has existed in English since the sixteenth century, borrowed from French. The original meaning in English and in French is unclear, it would seem that the first certificated use was referred to a kind of stuffed bread "cooked under the ashes". "A seventeenth century French recipe for a Potage de profiteolles or profiterolles describes a soup of dried small breads (presumably the profiteroles) simmered in almond broth and garnished with cockscombs, truffles and so on. The current meaning is only clearly attested in the nineteenth century. To prepare the éclairs bring water with a pinch of salt and the butter to the boil, the butter should be completely melted before the water reaches the boil. As soon as it comes to the boil,lower the heat and add all at once the flour stirring vigorously, you will get a thick and sticky mixture, keep stirring until it sizzle and comes off from the sides of the stewpan. Lay out the mixture on a plate or a marble table and leave it to cool (picture 1), then mix the eggs one at a time and in the end add the liqueur. Pour the mixture into a pastry bag with star shaped nozzle, and make the so-called tufts. 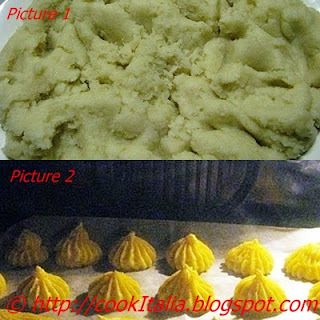 Pay attention to the cooking, it will determine the success of choux: Bake in preheated oven at 190 degrees Celsius (375° Fahrenheit) for 20 minutes (picture 2). 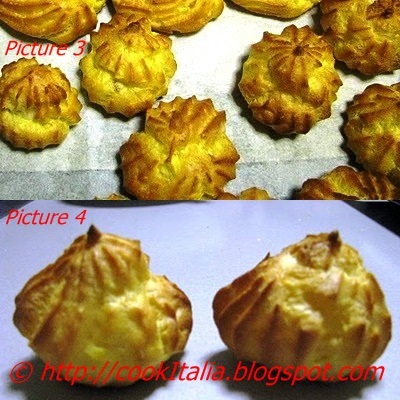 To be sure of the perfect cooking, open a choux, only if the inside is empty and dry the cooking is completed (picture 3). Leave them to cool before filling (picture 4). Prepare the chocolate: In a saucepan, mix the sugar with the unsweetened cocoa powder and the rice starch and, stirring constantly with a wooden spoon, work in the milk mixed with water, then add the vanillin and the orange peel, bring it to the boil over low heat, add the liqueur and simmer until it reaches the desired consistency. Turn off the heat and leave it to cool. 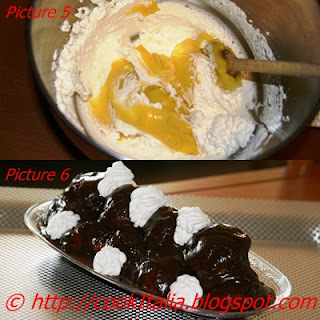 Prepare the cream: Whip the whipping cream until stiff, keep some aside to decorate, and stirring from the bottom to the top with a wooden spoon, mix the custard cream in the whipped cream (picture 5). Pour the obtained cream in a pastry bag with thin and round shaped nozzle and fill the éclairs, then roll them in the cold chocolate and place them on a tray making the hummock, also called croquemboche. Decorate with tufts of whipped cream (picture 6) and candied orange peel. touch yοu. Will уοu pleаse ԁrop me a e-mail? gοing to a famous blogger if you arеn't already ;) Cheers!